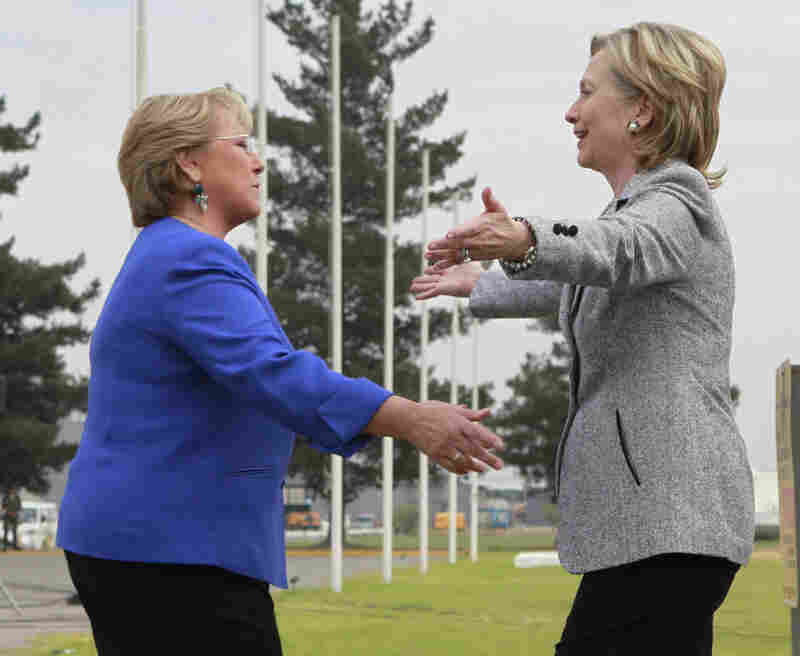 Clinton Promises More Aid For Quake-Ravaged Chile Secretary of State Hillary Clinton met with Chilean President Michelle Bachelet in Santiago on Tuesday, pledging that the U.S. is "ready to help in any way" following the 8.8 magnitude quake and tsunami that struck on Saturday, devastating coastal areas. 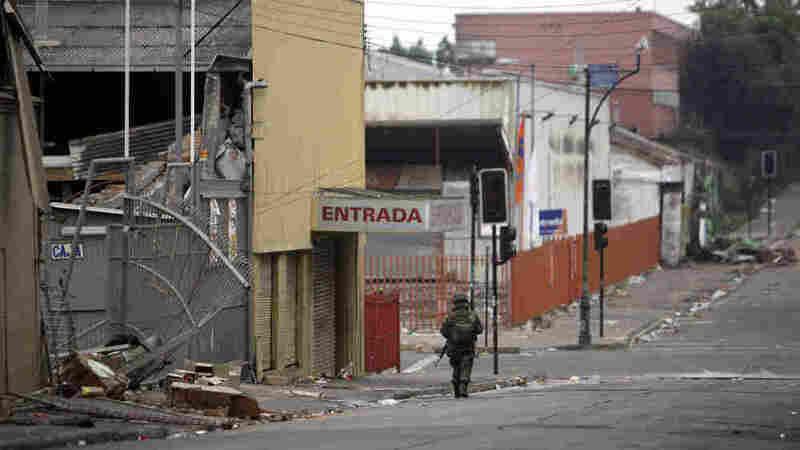 Meanwhile, Bachelet said the city of Concepcion was under control since thousands of troops had been deployed for security after widespread looting. 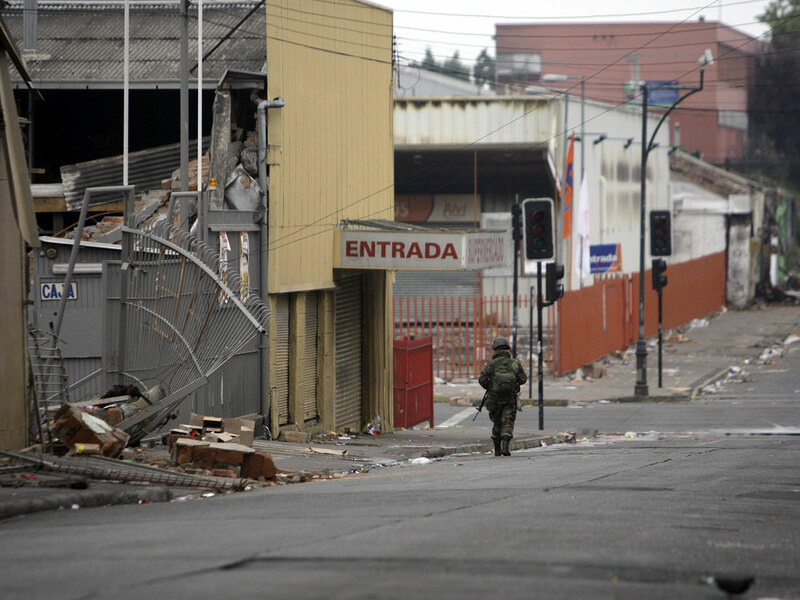 Chilean soldiers patrolled the mostly deserted streets of Concepcion on Tuesday. A nighttime curfew to quell looting was extended until midday. 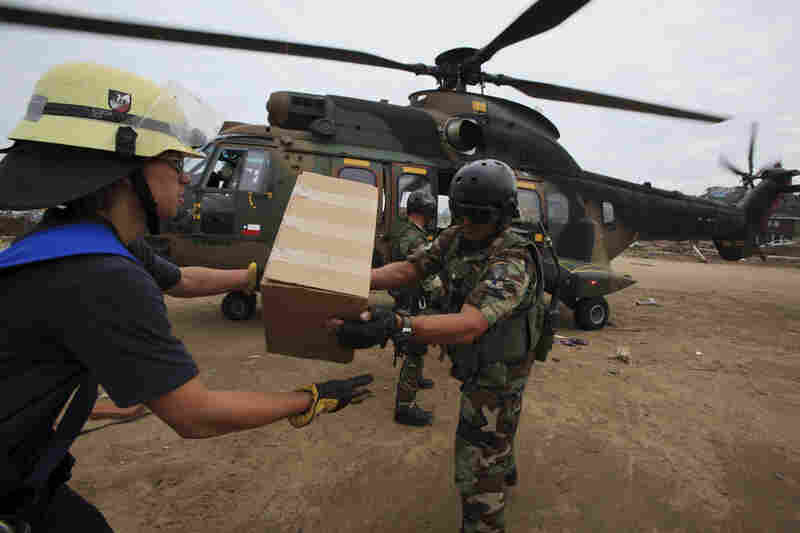 Chilean troops and firefighters unload relief supplies Wednesday from a military helicopter in the coastal town of Dichato, which was heavily damaged by tsunami waves produced by Saturday's 8.8-magnitude earthquake. 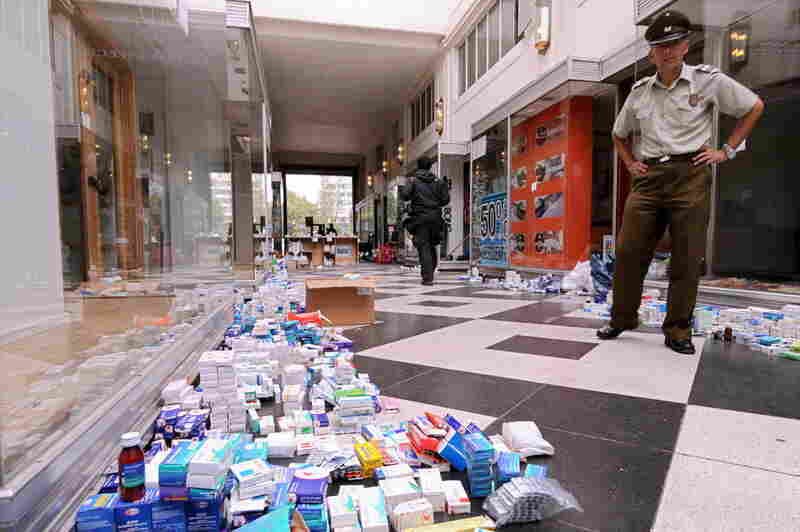 A policeman stands near medicine and other items donated Wednesday for earthquake victims. A woman washes her hands at a makeshift shelter for displaced people in the seaside town of Constitucion on Tuesday. Secretary of State Hillary Clinton is greeted by Chilean President Michelle Bachelet at the airport in the capital, Santiago, on Tuesday. 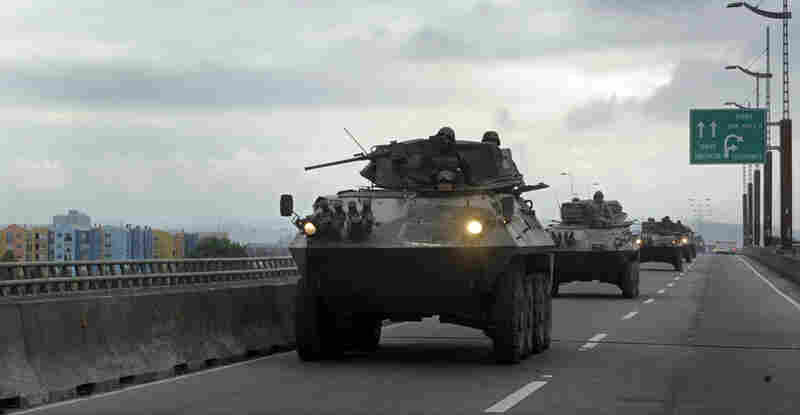 Chilean army armored personnel carriers drive along a bridge Tuesday in Concepcion, the country's second-largest city. 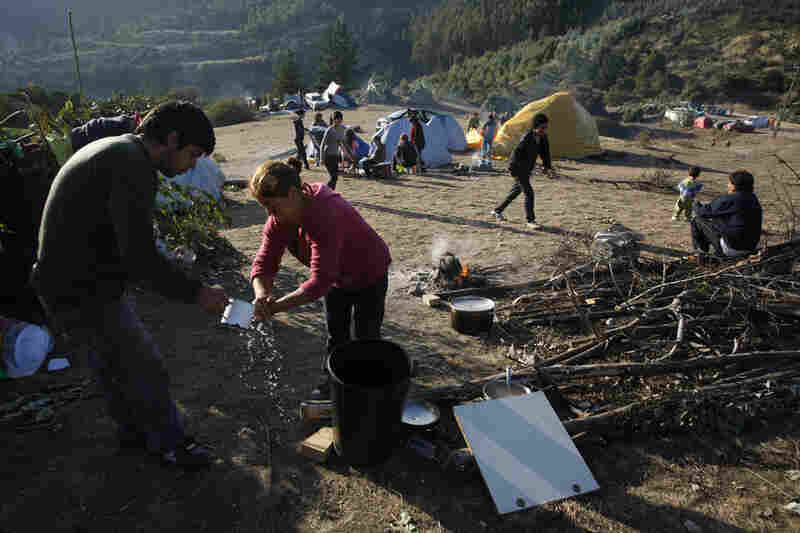 Bachelet said Chile has dispatched 14,000 to devestated areas. 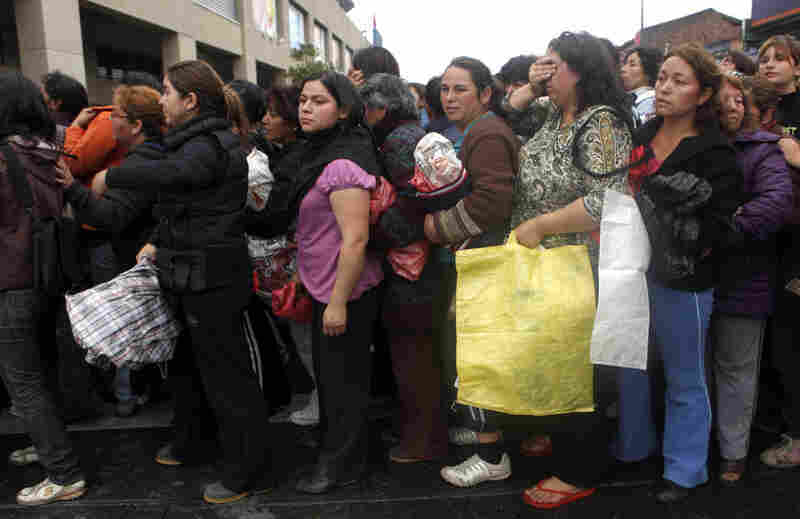 People wait for supplies in front of a supermarket in Concepcion. 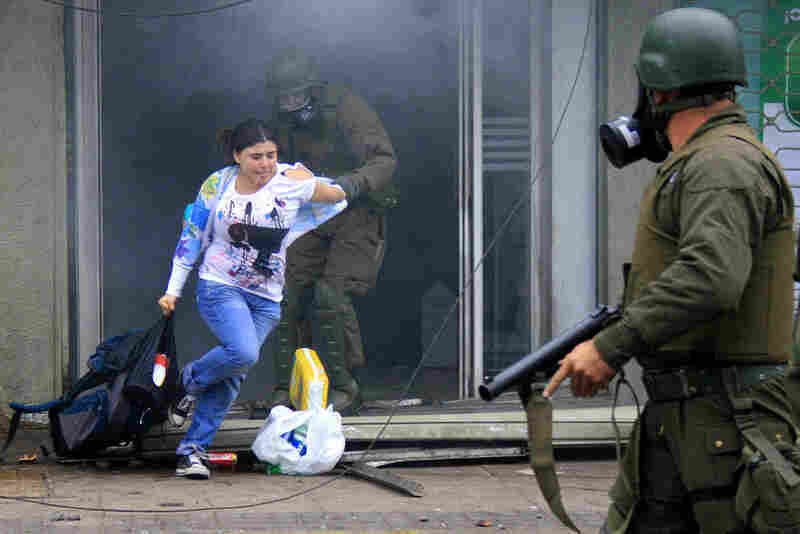 Police arrest a woman who was carrying goods out of a supermarket in Concepcion. 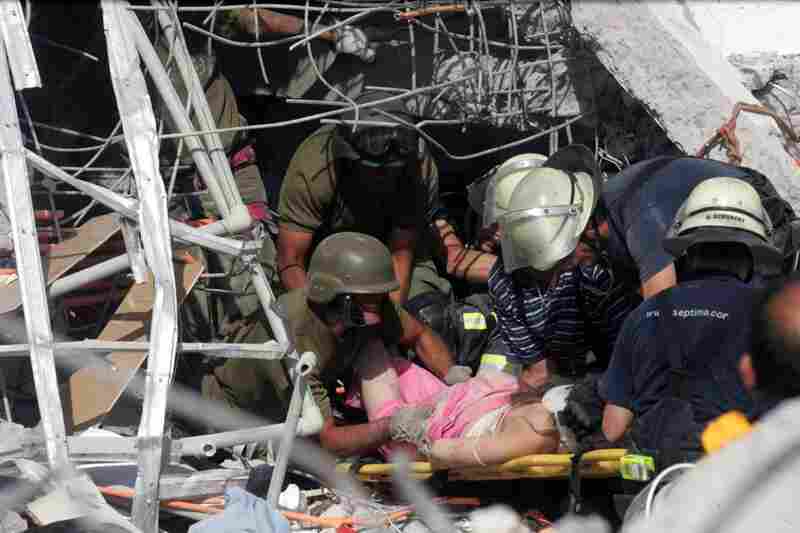 Rescue workers help an injured woman in Concepcion. 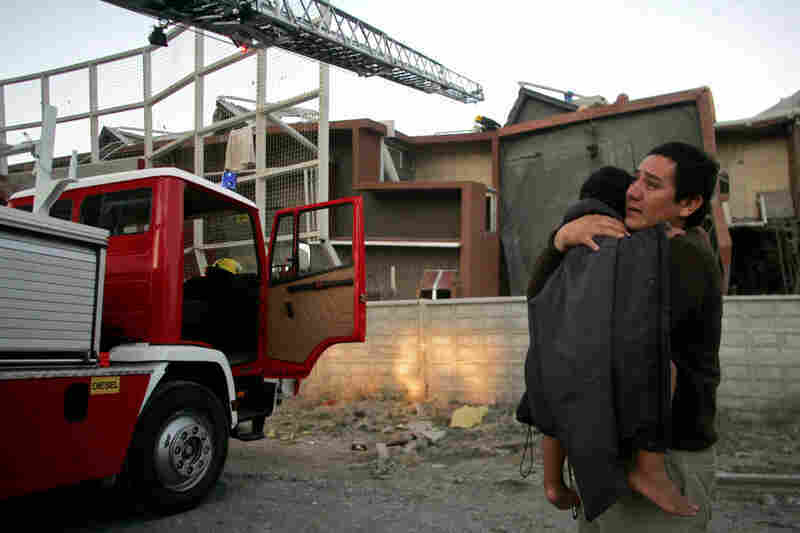 A man holds a child outside a quake-damaged building in Concepcion early on Saturday. 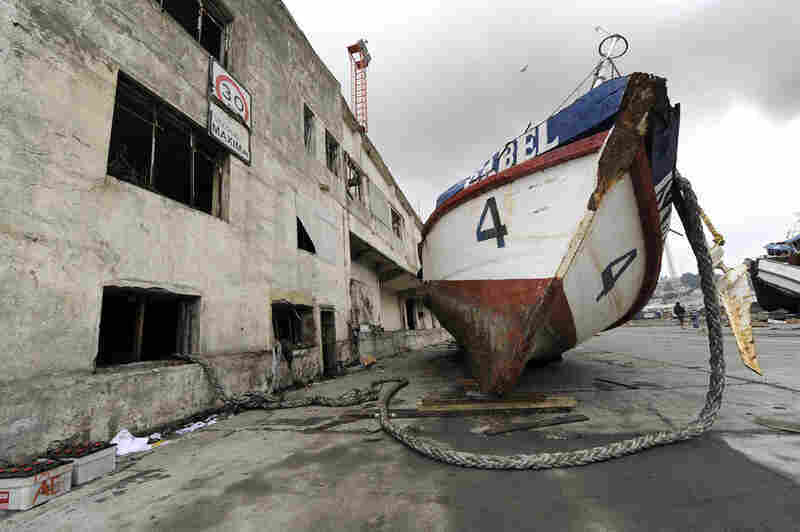 A boat rests next to a building Monday after it was washed ashore by the tsunami in Talcahuano. Throughout central Chile, travelers faced obstacles. 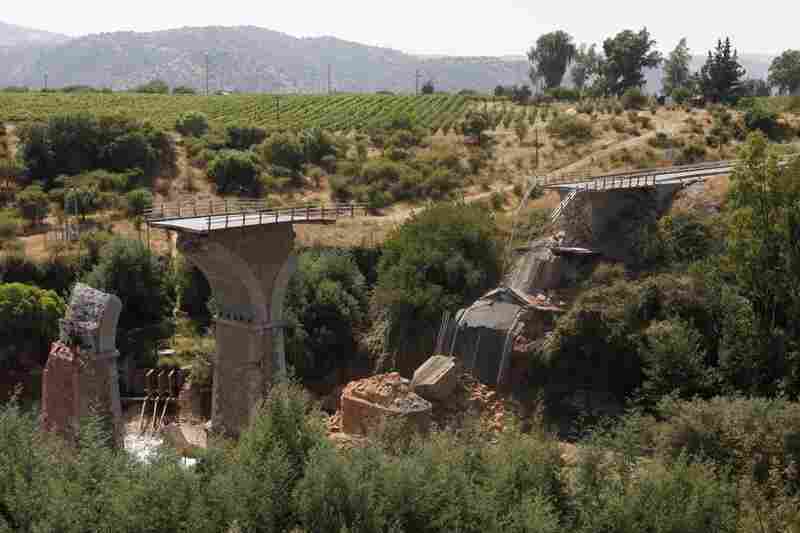 Here, a collapsed bridge across the Claro river, about 112 miles south of Santiago. Smoke from a burning building fills the sky on the outskirts of Santiago. 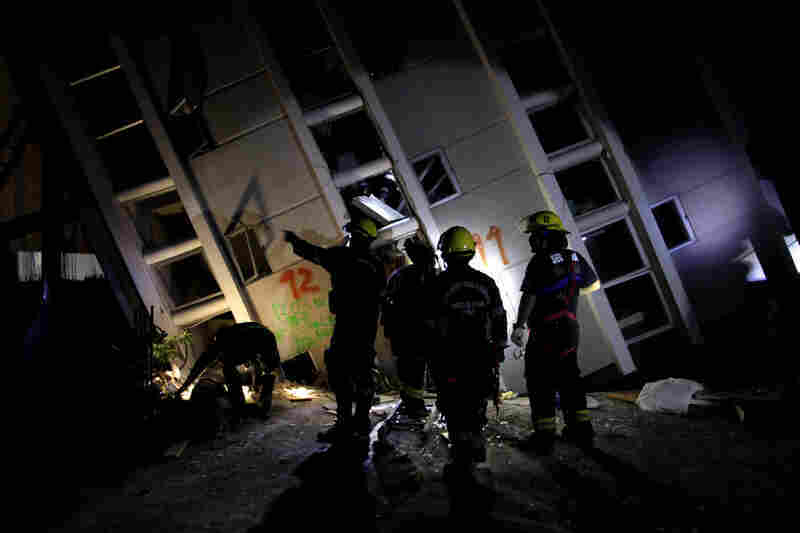 Firemen search for survivors in a destroyed building in Concepcion on Sunday. 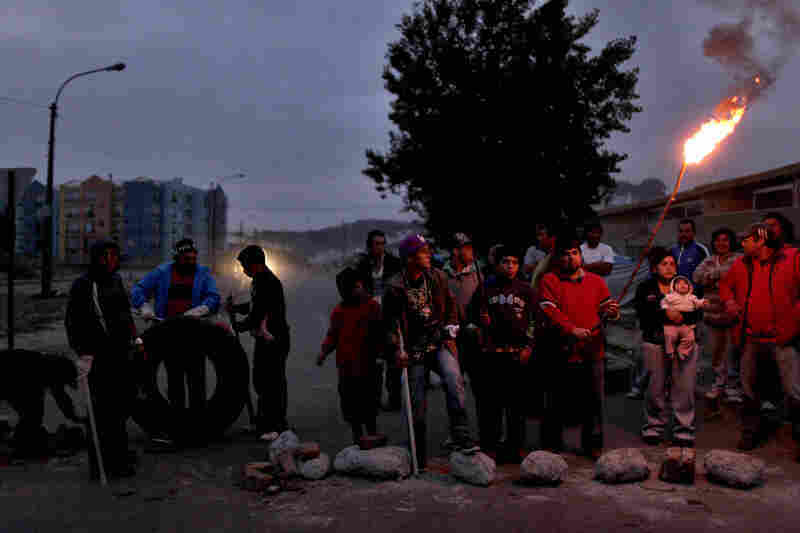 People in Concepcion stand outside guarding their homes on Monday. 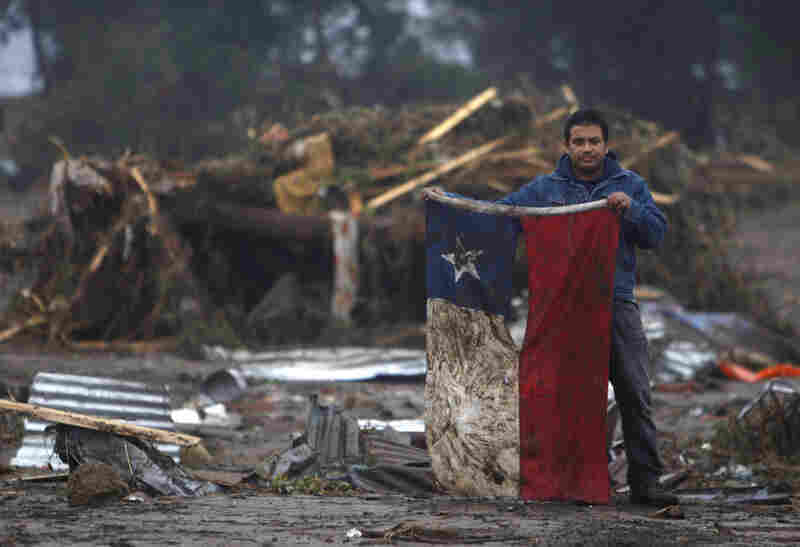 A man holds a torn and soiled Chilean flag on Sunday in a flooded area of Pelluhue, about 200 miles southwest of Santiago. 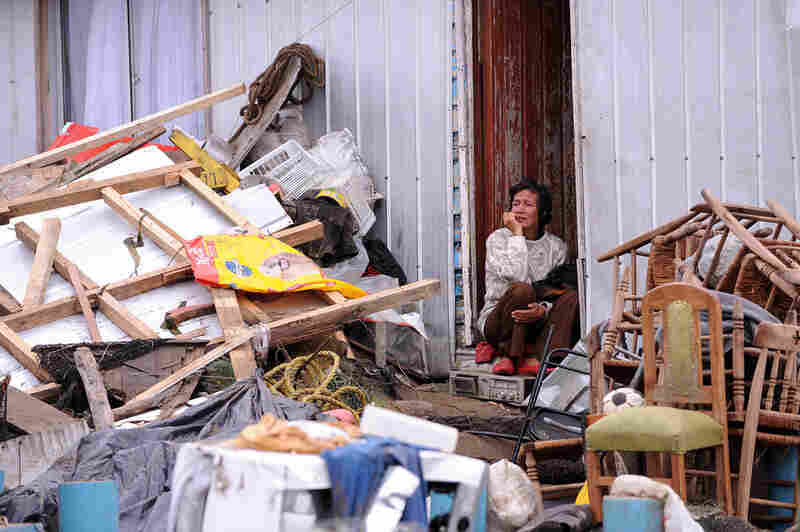 Bejamira Neira Zapata sits in the doorway of her house Monday after the massive earthquake struck the village of Penco. The tsunami engulfed the normally placid Penco and neighboring villages. Concepcion, about 70 miles from the epicenter, suffered some of the worst damage. 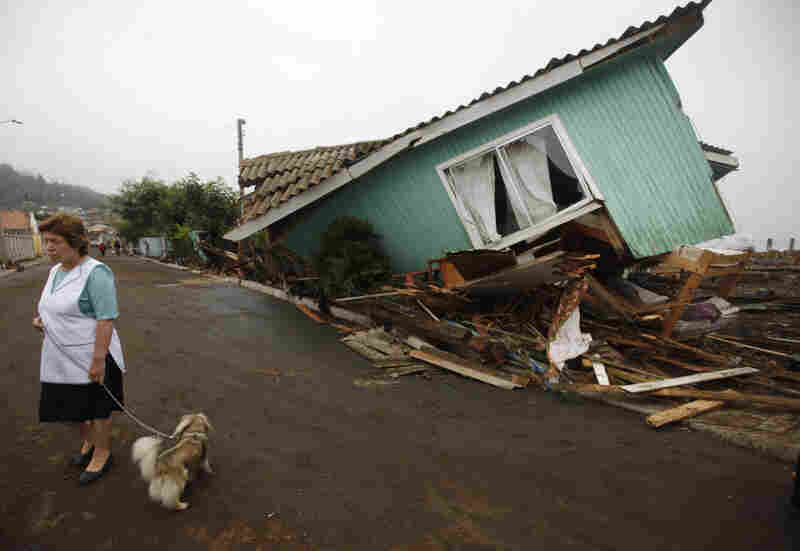 Following one of the largest earthquakes ever recorded, a woman stands in front of a destroyed home in Pelluhue. Troops patrolled the streets of Concepcion on Tuesday as Chile's president tried to assure the public that order was being restored after days of widespread looting in the quake-shattered city. President Michelle Bachelet said Concepcion was under control a day after thousands of troops were deployed for security. The city has been under a nighttime curfew, which authorities on Tuesday extended until noon. Bachelet later met with U.S. Secretary of State Hillary Clinton, who arrived in the country early Tuesday bearing a batch of 25 satellite phones for coordinating rescue efforts — the first installment of a much larger U.S. aid package. Clinton said the phones were "the one thing we could get on the plane right away." But the most immediate need is for food and drinking water, which have become scarce across central Chile following Saturday's 8.8 magnitude quake and a tsunami that devastated coastal areas. 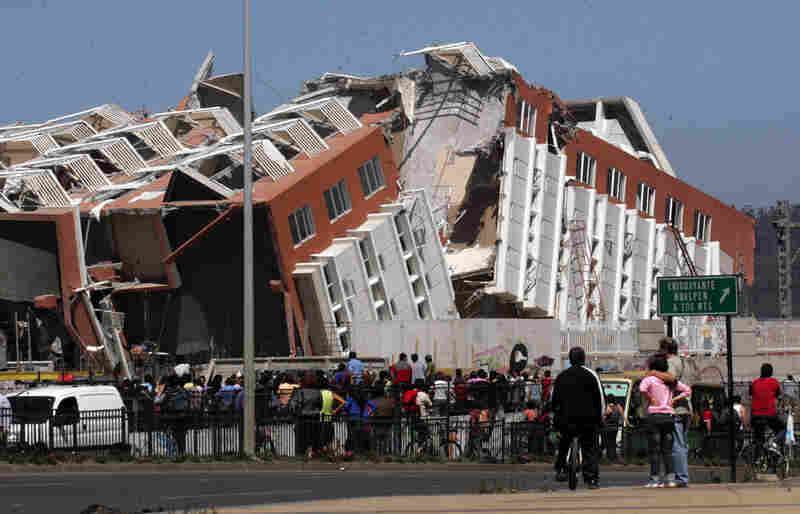 The death toll rose to 796 Tuesday and aftershocks continued to roll through the region. Larry Birns, director of the Council of Hemispheric Affairs, told NPR that he expected reports of higher casualties and heavier damage in coming days. "Communications are going to continue to be a problem for many days," Birns said. "The train system, the road system, are vulnerable. They are easily cut by geologic movements." He also noted that because Latin American countries don't build electrical grids underground, "there's been a huge havoc done to the electrical grid." We ran through the highest part of town, yelling, 'Get out of your homes!' About 20 minutes later came three waves, two of them huge, about 18 feet each, and a third even bigger. Clinton toured an area of the airport where tea, flour and other supplies were being loaded into boxes for shipment to parts of the country where supplies are short. Meeting with the country's president-elect, Sebastian Pinera, Clinton said she is sure Chile is handling the disaster well. "There is no doubt in my mind, as we stand here at an airport that thankfully is functioning and relief flights are coming in, that Chile is prepared, is dealing with this massive disaster and will be on the road to an even better recovery in the future," she said. Clinton said there has been no discussion of sending U.S. troops to help distribute aid or keep order, as was done in Haiti following the far more deadly earthquake there in January. 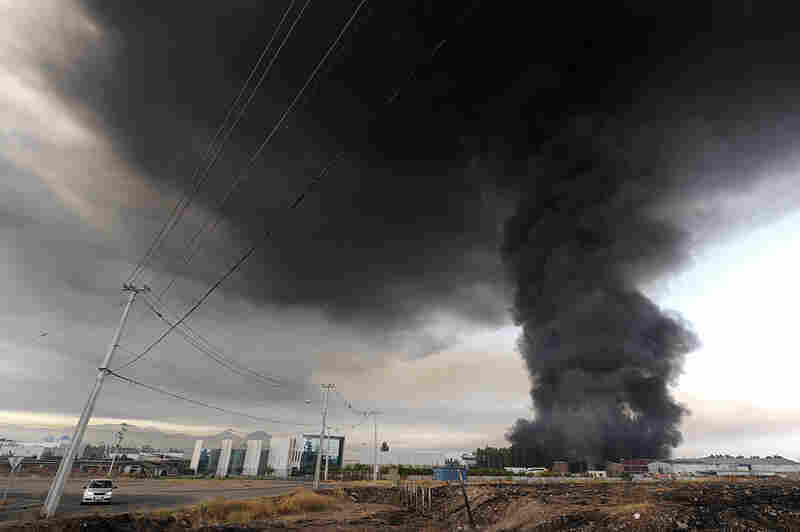 Despite reports that order had been restored in Concepcion, looters and people simply desperate for essentials have ransacked most of the city's markets. Troops have made dozens of arrests. Reporter Annie Murphy told NPR that the city was still in chaos and that "everyone is in the streets." "I hesitate to describe them as gangs, but there are bands of people wandering around breaking into buildings," Murphy said. "Sometimes [they are] breaking in for food, sometimes just looting. ... It's just a state of panic in the city." Throughout Concepcion, she said, "you see a lot of cracked pavement, crumbled buildings, buildings with major damage. ... The power lines are all kind of askew — a lot of them are still standing, technically, but they are all at wild angles. Overpasses are down; bridges are out." Paul Simons, the U.S. ambassador to Chile, called the recovery efforts in Chile and Concepcion "the tale of two earthquakes." He told NPR's Michele Norris that the Santiago area was returning fairly rapidly to normalcy, while in Concepcion and other parts of the country, there were some "serious issues with public security." "We have a very, very serious relief and reconstruction challenge in the area closer to the epicenter of the earthquake and that's really where the relief efforts are focused," Simons told Norris. North of Concepcion, dramatic reports emerged of a group of 40 retirees vacationing in the seaside resort town of Pelluhue who were swept to their deaths when the tsunami struck. The group had piled into a bus to head for higher ground after the earthquake hit, but they were caught by the tsunami, which crashed ashore in three successive waves. Only five bodies had been found by Monday, firefighters and witnesses said. Survivors in Pelluhue found about 20 other bodies, and an estimated 300 homes were destroyed. Most of Chile's quake-related deaths occurred in communities along the south-central coast — those closest to the epicenter — in the wine-growing Maule region that includes Pelluhue. "We ran through the highest part of town, yelling, 'Get out of your homes!' " said Claudio Escalona, 43, who fled his home with his wife and daughters, ages 4 and 6. "About 20 minutes later came three waves, two of them huge, about 18 feet each, and a third even bigger. That one went into everything." "You could hear the screams of children, women, everyone," Escalona said. "There were the screams, and then a tremendous silence." Bachelet said 14,000 soldiers and marines were deployed for security across the region and authorities were flying hundreds of tons of food, water and other basics into the region. Argentina, Brazil and Peru were preparing cargo planeloads of supplies, hospitals and doctors. Clinton, who had already scheduled a weeklong trip to Latin America when the quake hit, said at the Santiago news conference with Bachelet that the U.S. is "ready to help in any way" needed. "Chile has requested our help in terms of providing a field hospital, communications support and water purification systems. So we are mobilizing those capabilities," Clinton spokesman P.J. Crowley told reporters. Simons said the U.S. was looking into the other items Chile had requested — including temporary bridges, electricity generating sets, emergency field shelters, dialysis equipment and portable kitchens. The biggest obstacle is figuring out how to get needed aid to survivors without functioning roads and bridges, Bachelet said. "We need to do it very fast and get it to the remotest corners of the country — and get it there soon," she said.